Techlicious readers know there’s been no shortage of major data breaches recently. From Target to health insurer Anthem to the U.S. government, over 1 billion records have been lost to hackers last year alone. Not only has your name, address, and other personally identifiable information been leaked to the bad guys, but it’s likely been leaked multiple times. Want to see how often your own information has fallen prey to hackers? 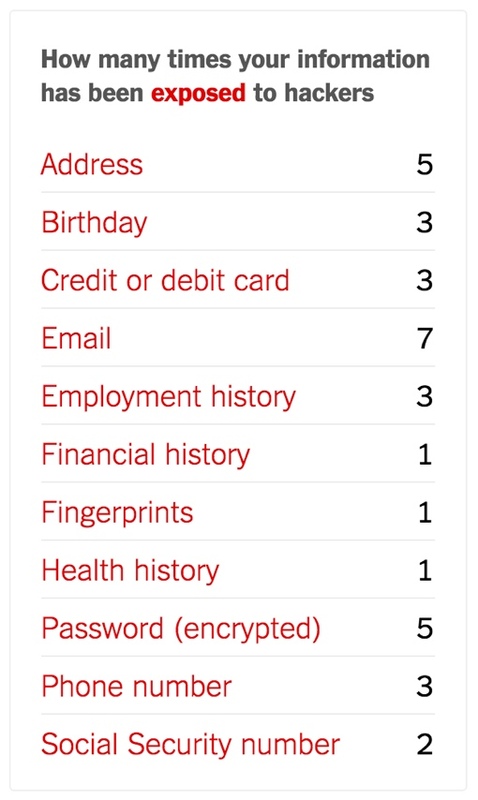 Today, The New York Times published a new interactive quiz that calculates the number of time each piece of your key personal data has been compromised. It tracks your address, birthday, credit/debit cards, email, employment history, financial history, fingerprints, health history, password, phone number and Social Security number. Taking the quiz is simple – you simply answer a brief series of questions about what websites and stores you’ve frequented. It takes only a minute or two to complete. My results were pretty shocking: I knew my data was compromised, but I had no idea it's been compromised so thoroughly. If the site reveals that your information has been compromised numerous times, don’t panic – that’s a pretty normal circumstance these days. Still, you should consider placing a freeze on your credit file – that will prevent crooks from (easily) opening lines of credit in your name. You should also make it a point to change all your passwords that may have been compromised (if you haven’t already). Consider using a password manager too – they allow you to easily and safely store complex, hard-to-crack passwords. You can find and take The New York Times data breach quiz here. My password has only been stolen four times - Woohoo!